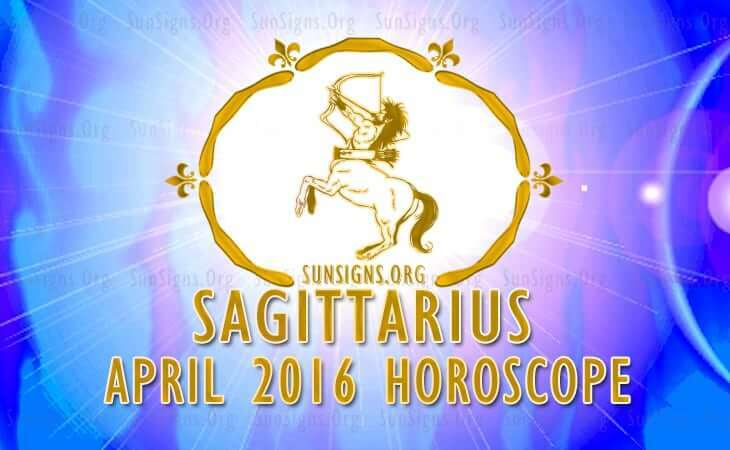 April 2016 Horoscope for Sagittarius foretells that many planets are in the Southern sector of your horoscope. Hence for Sagittarians the focus should be on home affairs and emotional stability this month. Emotional health for the Sagittarius personality will improve chances of succeeding on the career front. Establishing harmony in family circles will be tough but necessary in April 2016. Compromise and conciliation are required than aggression and independence. The Solar Eclipse of the 19th April will impact your spiritual beliefs, and your ideas about religion may change drastically. You will be under mental stress to accept the new belief systems. For Sagittarius professionals, a job change is predicted in April 2016 and this may be because of the pressure from family. This is an auspicious time for this move. You will be entangled in the implementation of a few big projects and this will require lot of drive and persistence. You will face stiff challenges and you will succeed if you are diligent and patient. The April 2016 monthly predictions also suggest that the environment at the work place will face radical changes. Businessmen will find the going tough. People seeking jobs will be successful in landing good jobs after mid month. Sagittarius, your financial acumen will be good in April 2016 which will help you in making more money during the month. You can afford to take risks and speculative investments will give good profits. Problems with government authorities over tax issues are expected and they require prompt and strong response from you. The April 2016 love horoscope for the Sagittarius zodiac sign predicts strong relationships will put an end to all conflicts. Emotional balance is necessary for the continuance of the relationships. There will be more sexual excitement in the partnerships after the 16th. Married Water Bearers have to be more tolerant towards each other during the time of eclipses. Single Archers will form instant relationships just for the sake of fun and pleasure. Serious commitment will be missing from their side. Be ready to face a breakup. Couples planning to have children should think twice. Health will be remarkable during April 2016 for the Sagittarians and can be improved by physical workouts. Nagging health problems will be resolved by new ingenious methods like simple home remedies. To conclude, the Sagittarius April 2016 horoscope warns that you might need to resolve a few domestic issues before concentrating on your career.